The Council launched its LDP Preferred Options Paper on the 29 May 2018, and it is now available for inspection and public comment. The Preferred Options Paper (POP) is the first of three public consulation documents that the Council will issue during the LDP process. Its publication marks the final stage of Stage 1 (Initial Plan Preparation) of the LDP process. The POP is a consultation paper designed to stimulate debate and encourage feedback on key issues of strategic significance which are likely to influence the direction of the Council’s new LDP. The POP outlines the vision and strategic objectives along with a set of key issues and associated options for addressing them. The Council’s preferred options are indicated in the Paper along with a justification for each preferred option. The consultation period for the POP will run for a period of 12 weeks from 1 June to 24 August 2018. Your comments are invited on the options raised in the POP. Comments must be planning related and should be strategic in nature, as the Council will use the findings from the POP consultation exercise to inform the preparation of the draft Plan Strategy. Comments may be submitted by email, preferably using the LDP POP Questionnaire Response Form, to: ldp@nmandd.org. 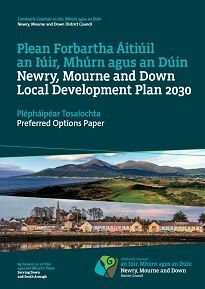 Alternatively you can write to the Council at ‘LDP:Preferred Options Paper, Development Plan Team, Council Offices, Downshire Civic Centre, Downshire Estate, Ardglass Road, Downpatrick BT30 6GQ. To ensure equality of opportunity in accessing information, copies of this POP document and the associated documents in alternative formats are available on request. Where the exact request cannot be met we will ensure a reasonable alternative is provided. The Council is keen to hear the views of its residents, businesses, community and voluntary groups on its Local Development Plan Preferred Options Paper. There will be a number of public drop-in sessions across the District, during the consultation period, where interested parties can call in to discuss the POP with planning officers. Details of these sessions are listed below.